More and more companies are investing in this new kind of farming. Part of the answer will definitely be changing the way we grow our food. And a new trend is expected to assist on that front—vertical farming. Vertical farming doesn’t promise to radically change the way we farm, only make it more efficient, productive, and take up less space. An example is Urban Crops, a new startup that grows plants using a mixture of indoor farming techniques and hydroponics. Their facility is in Waregem, in eastern Belgium. Here, plants grow under a purple light delivered by LED lamps. The light is a mixture of blue and red lamps that seems to create the optimal conditions for growth. Those plants are fed with a hydroponic system that delivers water laced with special minerals and nutrients. The whole system can turn a 50 square meter space (540 square feet) into 500 square meters of usable farm space. 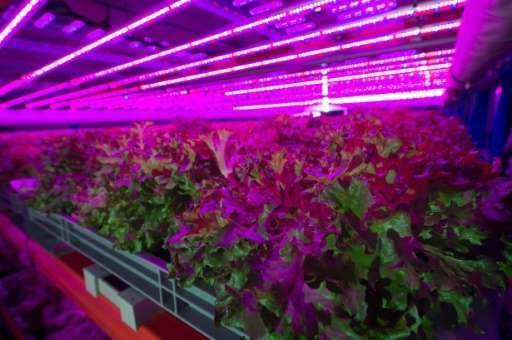 Their 30 square meter (323 square feet) facility is able to produce 220 lettuce plants every day, using only 5% of the water needed in traditional farming. But Urban Crops is not alone in this farming revolution. More and more companies are investing in facilities that try to do the same thing. The biggest facility right now is a 14,164 square meter (3.5 acre) facility in Newark, New Jersey, run by Aerofarms. This facility can produce up to 2 million pounds of fresh, leafy greens a year, and is equivalent to 139,931 square meters (13,000 acres) of actual farmland. A Swedish project wants to top even that. Plantagon Agritechture and Sweco Architects have revealed a project called the Plantagon World Food Building in Linköping, Sweden. That is a “plantscraper” 16 stories tall. Meanwhile, Target has revealed a partnership with MIT to bring vertical farming techniques to stores. The partnership wants in-store vertical farms, that will make supermarket-bought produce fresher and, possibly, healthier. Drones in Agriculture: Are They Really Taking Over?